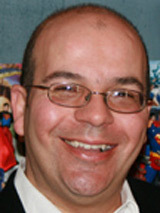 Chief Innovation Officer, Starlight Runner Entertainment, Inc.
Fabian Nicieza wrote and created dozens of characters and storylines for Marvel Entertainment’s X-Men franchise, which generated hundreds of millions in revenues from comic sales, animation, action figures, videogames and feature films for Marvel, Toy Biz, Fox Entertainment, Sega, Capcom and Activision. The titles Mr. Nicieza has also written include Superman, Batman, Robin, Spider-Man, Avengers, Buffy the Vampire Slayer, Power Rangers and Captain America, while he has edited titles as diverse as Barbie, Ren & Stimpy and William Shatner’s TEKWorld, with combined sales in excess of 100 million copies, grossing over $220M. As Chief Innovation Officer and Lead Writer for Starlight Runner Entertainment, Fabian has provided story analysis, brand and corporate narrative development, and transmedia production services on some of the world’s most successful intellectual properties for clients including Sony (Men in Black, Amazing Spider-Man), Disney (Pirates of the Caribbean, Tron Legacy), Fox (Avatar), Microsoft (Halo), Mattel (Hot Wheels), Hasbro (Transformers), Coca-Cola (Happiness Factory), and Pepperidge Farms (Goldfish). His work includes helping corporate clients understand and manage their story worlds, defining and refining their franchise characters and content in anticipation of cross-platform narrative rollouts. He also spearheads Starlight Runner’s original content development program geared to create new properties across traditional and digital platforms.